I have to tell you that as much as I enjoy shooting with my DSLR's or mirrorless cameras, there's something magical about using a Polaroid SX-70, pressing the shutter button, the motor whirls driving the photo through the rollers at the front of the camera, releasing the chemicals included forming the image, the photo emerging through a slot located on the front of the SX-70, and instant gratification! The SX-70 was first introduced in April 1972 in the US by Polaroid, and began selling nationally in fall 1973. Although the high cost of $180 for the camera and $6.90 for each film pack of ten pictures limited demand, the camera was widely admired by those wishing to own one. There were a variety of models beginning in 1972 with the original SX-70, though all shared the same basic design. The first model had a plain focusing screen, followed by a revised type 2 model featuring split-image focusing, that being the model seen here. The design is quite interesting being an SLR that allows you to see the subject being photographed directly through the lens, just as with the DSLR's that I normally shoot with. Each film pack has a built in battery that powers the camera through its cycle when a photo is shot. Interestingly enough, the original "Polaroid" film used mercury batteries part of each film pack, where as todays "Polaroids Originals" film use lithium-ion batteries built in to the film packs. The camera folds flat, allowing it to be carried in my over the shoulder bag when not in use, or in my back pocket where it can be easily reached and quickly opened to shoot those fun photos that pop up. One feature of SX-70 print is its ability to be manipulated while developing, and for some days after because the emulsion stays soft for several days, allowing you to press and manipulate the emulsion to produce effects somewhat like impressionist paintings. Manipulation of the photograph is best done about two minutes after the picture has fully developed. It will stay soft and workable for about 5–15 minutes. Some colors will be more difficult to work on (dark green), whereas others are workable for a long time (red). If the photograph is on a warm surface or slightly warmed in an oven, image manipulation is made easier. 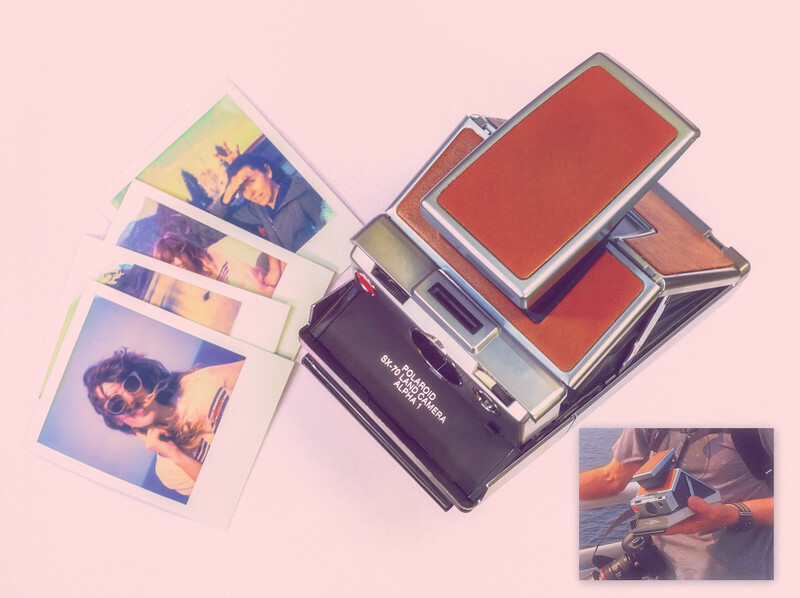 Today the SX-70 is highly sought after by Polaroid enthusiast's, and retains a cult following. Photographers such as Ansel Adams, Andy Warhol, Helmut Newton, and Walker Evans praised and used the SX-70 in their day. What can I say, I've been using SX-70's for close to 30 years, and love the things! They are especially fun to shoot photos of people with, and the photos are a hit with those whose images appear by magic in front of them.